Most of us have a brush. That's it! We may have had it for years and we use it for all styles without a thought. But...brushes today come in many shapes, materials, coated & non-coated, etc. Using the right brush for your style can make it much easier to achieve the look you want. Today, we'll discuss bristle types. Synthetic Bristle Brush. Usually made from nylon, synthetic bristles are best for super thick hair types. They don’t create as much static as natural versions, like boar. Plus the stiffer bristles make for easier detangling. Natural Bristle Brush. Usually make of boar bristles, these brushes are super soft and help to distribute your hair's natural oils all the way to the ends. Gives you some seriously shiny strands. 100% boar bristle brushes may be a bit pricey, but the healthy hair benefits make them worth it! Mixed Bristle Brush. Gives you the benefit of a boar bristle's shiny hair and the benefits of a synthetic bristle's detangling ability. 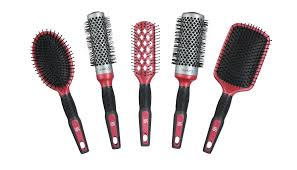 Mixed Bristles are the most popular type for hair stylists since they work well on everyone's hair. Tomorrow we'll discuss brush shapes and types and how they help you achieve your style. SURPRISE! 20% off everything! Leap Year weekend. Vibrant hair colors without the risk! Must-Do Tips for Curly Hair! It's all about FREE! and other stuff!